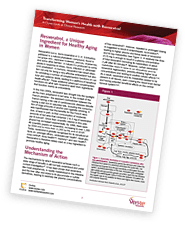 Download an informative whitepaper to learn more about the latest scientific thinking behind the benefits of resveratrol. *By downloading this content, Evolva would like contact you regarding this feature and keep you informed of its products and services by email or by phone. You can withdraw your consent at any time by clicking the unsubscribe link in such email or replying to the email.